Thank you for the outpouring of support and for your belief in Wilmington and our Island Beaches during September's hurricane. 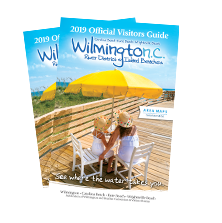 Wilmington and our Island beaches are open for business and ready to welcome back visitors. Look for many of your favorite fall festivals and activities to offer countless ways to experience the area. #OverFlo - The small business owners of downtown Wilmington care and are ready to step up to make a difference. Participate in a series of eclectic actions to showcase and help support the local community affected by Hurricane Florence.